I’m not going to lie. This was a slap dash, poorly thought out project. I just suddenly, desperately needed a pair of leather skinnies with feature zippers and I thought I could whip them together using a bit of cheap, novelty fabric. 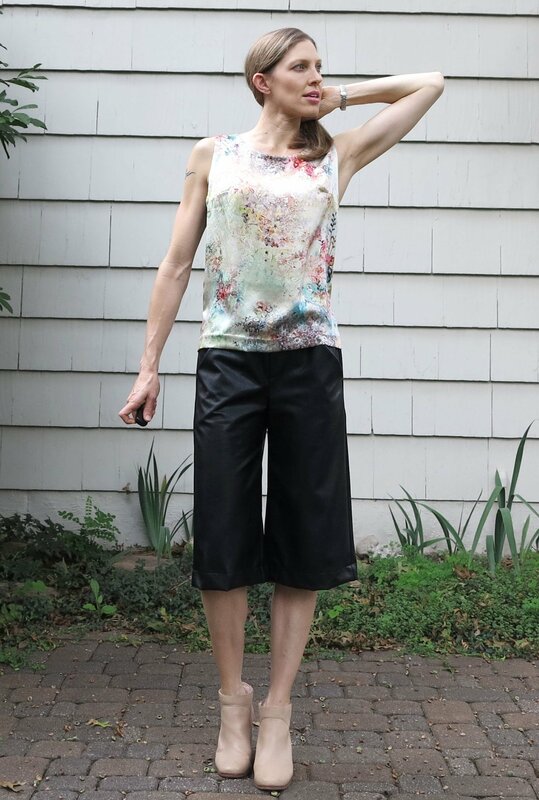 I freestyled an existing trouser pattern into a slimmer design. However, I realised along the way that the fabric (faux stretch leather) needed to be very close fitting in order to minimise the sight of ugly wrinkles and creases. I should have started with a leggings pattern, not a pants pattern. I had to narrow the legs further as I went, by inches at a time. It was never going to bode well. The irony of the matter is also that this faux stretch leather is only slightly stretchy, and in one direction only. It’s like wearing skinny jeans in non-stretch denim. There’s not a lot of give when I bend and stretch. I’m pretty sure I’m going to rip the crotch seam next time I wear them, but I’ll still happily wear them until I do. The three feature zippers are non functional. I installed them as per this tutorial, however I covered the backs of mine with a soft fabric, rather than add pocket bags. In any case, it was a fun make. 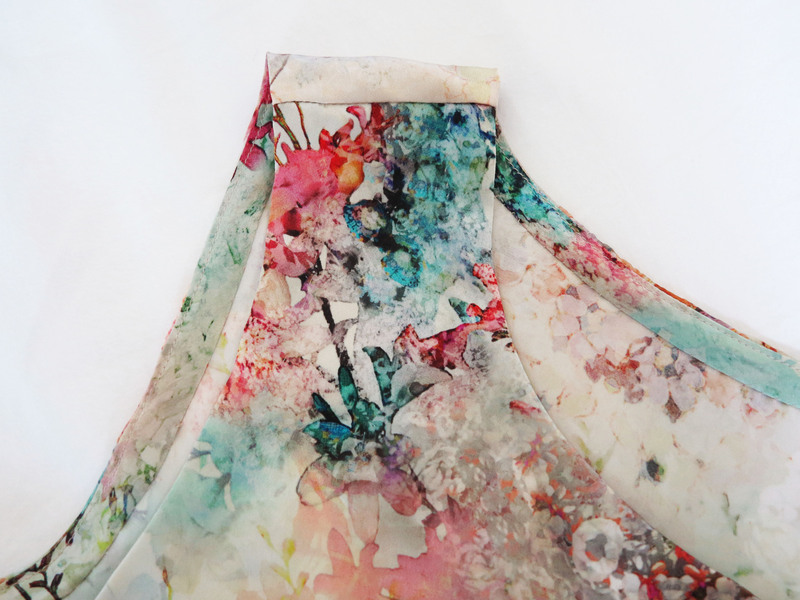 I needed a frivolous sew after I spent so many hours on my coat, and these pants suited the purpose well. And besides, everyone needs the occasional wadder to keep things real! 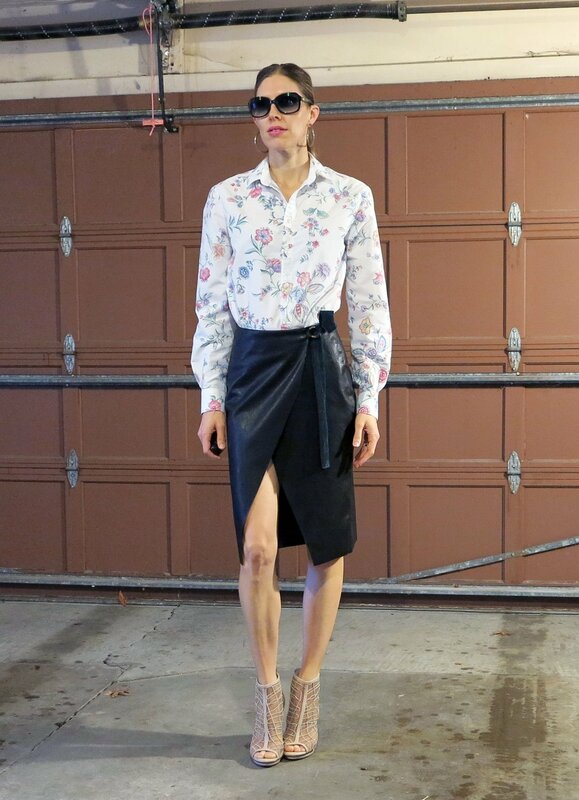 This entry was posted in Fabric.com, leather, leggings, pants and tagged faux leather, jeans, leather, pants, skinny pants, zippers on February 6, 2016 by Debbie Iles. I’m loving the look of off the shoulder tops right now. It’s a little difficult to get on board with this trend during Winter, but it helps to keep the sleeves long and by adding a little leather. 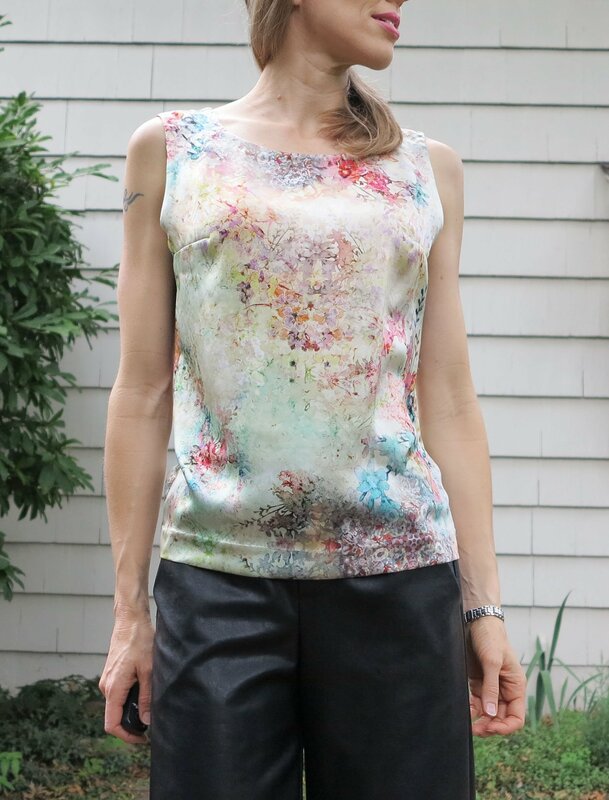 I modified an existing long sleeve top pattern to make this top. It was a very easy pattern modification as you can see from the diagram below (excuse my dodgy freehand sleeve cap!). All I did was draw a line across the front and back bodice at the point I wanted my off the shoulder neckline to reach (red dotted line). I cut the pattern pieces off at this line, including the sleeve cap. Finally, I attached a band (the exact size of the top neckline) which I used to encase elastic to hold the top up securely. I’m so pleased with how this top worked out that I’ve already cut out a second, shorter sleeve version. 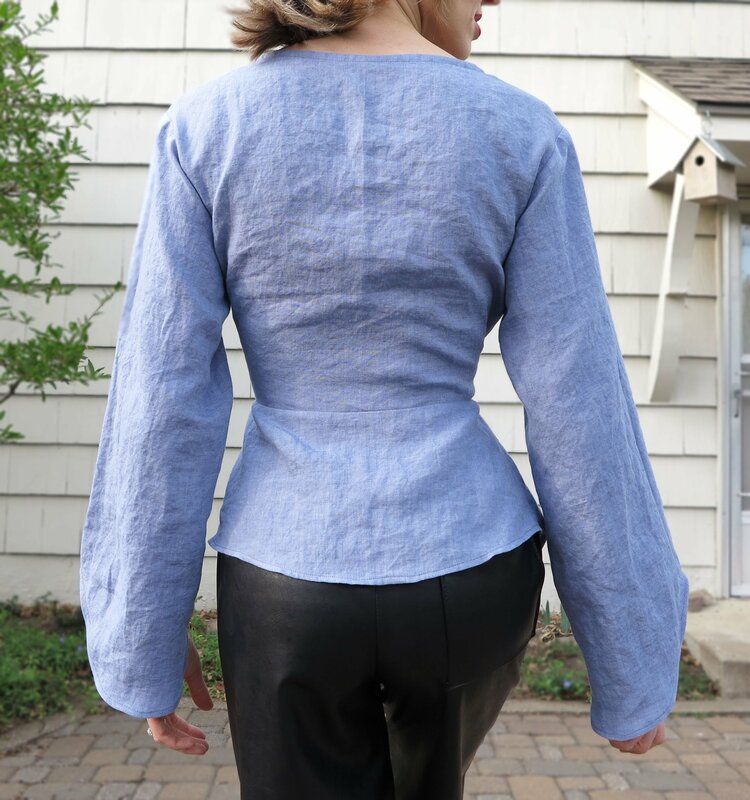 I used a one-way-stretch, pure cotton jersey for this version, which is why my top isn’t as clingy on the arms and body as it could be. A knit fabric with two-way-stretch would work even more beautifully. It all depends on how well the unmodified top pattern fit you in the first place. 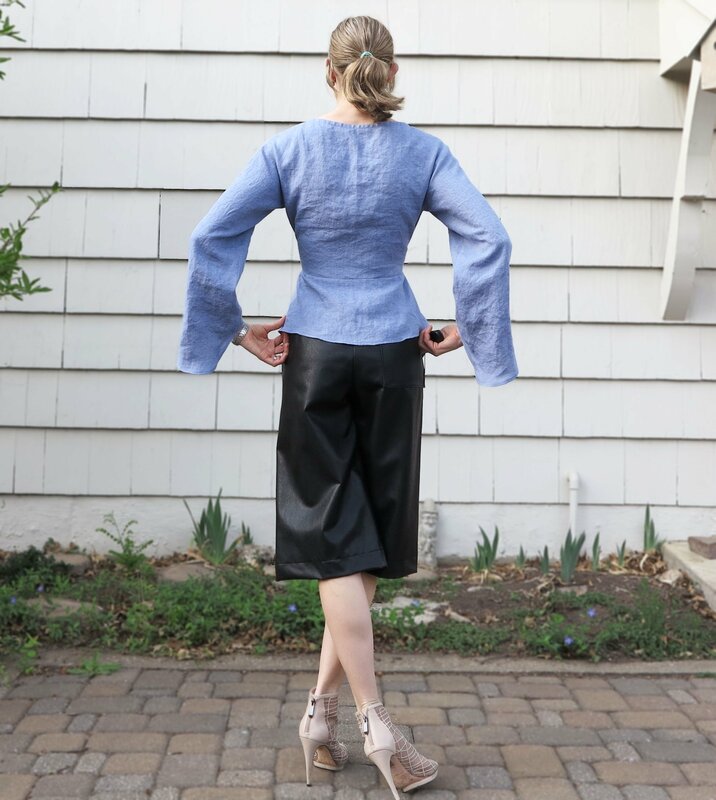 This entry was posted in cotton, leather and tagged blue, cotton, jersey, leather, Mood, off the shoulder, pants, self-drafted, Tandy, top on January 13, 2016 by Debbie Iles.